Totally recycling one of UBC’s former slogans for the title of this, but it’s fitting! Perhaps you’ve noticed some buzz around the church on how we can signal that there is life in our building and that we are a beautiful and vibrant community on the inside of our walls. One of the discussions we keep coming back to is the situation with our front doors. 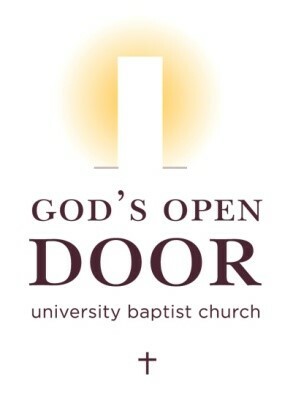 An easy way to signal that we are a functioning church (aside from a glowing “open” sign) is to be able to have our front doors open on Sundays as much as we can. And then to use them. The Worship Support team is already stretched thin with limited volunteers and numerous positions to fill. So we’ve started a new committee, the Front Door Committee, to begin brainstorming these possibilities. We have a beautiful building with some really fine detailing on the facade and around the windows. How often do you walk around to the front and really just take in the large 1920s building? It’s quite striking when you stop. It is said that the eyes are the windows to the soul (cheesy, I know, but stay with me), so then what if we look at the front doors as the figurative (and quite literal) window to our church body. I remember the first time I stepped into the sanctuary at UBC sometime in April last year and I was immediately stricken by how beautiful and holy it felt. It’s a stunning space that feels large yet also intimate. The older architecture, the crazy amount of marble for the giant baptistry, the shell that surrounds the choir loft, and then about 100 eight to twelve feet tall organ pipes (that don’t even show the condition of the instrument!). You miss a lot of that grandeur when you enter from the side door by the piano or elevator. When you walk through the striking facade of our front doors and up the stairs, you enter in a sacred space and when you are surrounded by our sanctuary for the first time (and second, and third, and fourth…) you are transported to a different place. A more holy place. The Front Door Committee is wanting to open the doors at 9:30 on Sunday mornings with coffee for any passersby to grab their attention and show that we are a living, breathing church! However, when you remove people who teach Sunday School, people in the choir, and the volunteers who are already being positioned elsewhere around our property, we are having trouble finding the volunteers to cover the front door. So here’s my shameless request (spoiler: there are two requests): We need volunteers to either volunteer once, or for a recurring position at the front doors to make sure we are able to open our doors safely! I ask that you consider if you’re able. The second request, and the much easier request: Once we have this up and running (we started this past Sunday! ), let’s make a concerted effort to enter through the front of the building. I know it’s not the most convenient. I know it’s a little further of a walk. I know it’s not right next to your Sunday School rooms. But it can make a big difference with minimal effort for those of us who are able. I know we’ve even tried this before and it fizzled out, but I’m nothing if not persistent. UBC has so much to offer. We have a warm, friendly, and welcoming congregation with a traditional worship style with progressive theology. I know we all want to share that with people. So let’s open our doors up to it!